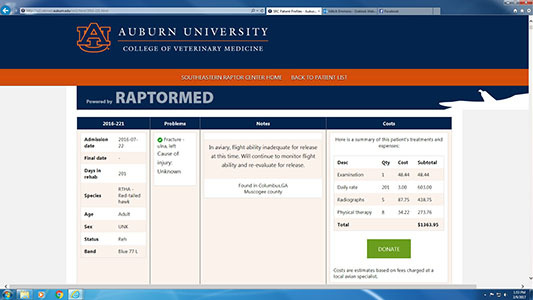 RAPTORMED has made it possible for the Southeastern Raptor Center at the College of Veterinary Medicine to maintain complete medical case records on its web site. Most who have seen it will agree that seeing the eagle pre-game flight at Auburn University home football games is one of the most exciting and dramatic traditions in Southeastern Conference sports. RAPTORMED, developed by Dr. Dave Scott, a veterinarian with the Carolina Raptor Center in Huntersville, N.C., was purchased by the Southeastern Raptor Center at Auburn’s College of Veterinary Medicine in 2015. It was expanded this year, and now, the center has its complete case management system on its web site with information fully accessible to the public. “I cannot overly describe how much RAPTORMED has helped us in our operation,” said Dr. Seth Oster, an assistant clinical professor in the college’s Avian and Exotics Service, who serves as the primary veterinarian with the Southeastern Raptor Center. In addition to improving the process and management of medical case records, Dr. Oster says RAPTORMED also generates a number of reports and other documents that are federally required for raptor care programs. RAPTORMED is designed for simplicity, Dr. Oster adds. Searchers can click on the case number link to go to the next screen, which is the case record for that individual bird. “It is a full and complete on-line medical record system,” Dr. Oster said. RAPTORMED has proven to be valuable for teaching and research as well, according to Dr. Oster. The program also have value to researchers. “The records are an effective method of obtaining case information, and will allow for further research opportunities in the future,” Dr. Oster said. The Southeastern Raptor Center handles more than 350 injured birds of prey annually, according to Dr. Oster. All patients are brought in by individuals or conservation groups. These birds are treated for medical illnesses or injuries, rehabilitated to the extent possible, and ultimately, birds whose recovery is sufficient to ensure survival, are released back into the wild. Center staff also conduct educational programs throughout the Southeast using non-releasable raptors. For more information about the Southeast Raptor Center, or, to access RAPTORMED, visit the center’s web site at: https://www.vetmed.auburn.edu/raptor/.